Lahore, now becomes the 3rd Pakistani city after Karachi and Islamabad which officially equipped with high end CCTV Cameras connected with integrated video surveillance system. CM Punjab Mian Shehbaz Sharif today i.e, 11-Oct-2016, inaugurated the Lahore Safe City Project. CCTV surveillance system is part of the Punjab Safe City Project. Lahore gets IP based Night-Vision cameras, according to news details 8023 surveillance cameras have been installed, 800 vehicles equipped with cameras will also be supporting the integrated command and control center. The project will make use of 4G LTE technology for the entire network's communication neds. The live streams of the cameras will be deliverer over 4G network. Lahore CCTV video surveillance project is part of Punjab Government's (PSCA) "Punjab Safe City Authority" and PPIC3 "Punjab Police Integrated command & Control Center". Some of these projects will be functional in future. 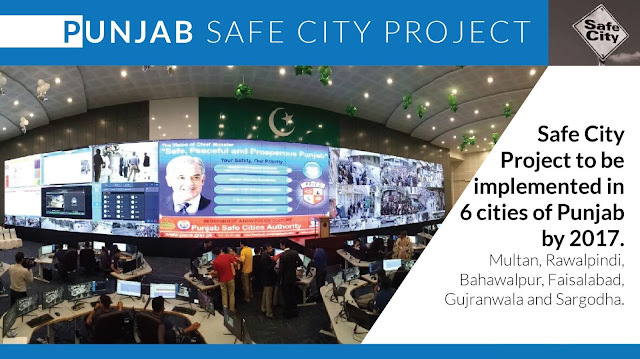 Rawalpindi, Multan, Faisalabad, Bahawalpur, Sargodha and Gujranwala are the next nominated cities for Punjab Safe City project. In Lahore, the security cameras system in installed and provided by the Chinese tech company Huawei.